Splashproof portable Bluetooth speaker with powerful sound and speakerphone technology. No more worrying about rain or spills; you can even clean it with running tap water. Just don't submerge it. Wireless Bluetooth connection for up to 3 smartphones or tablets to the speaker. Built-in rechargeable Li-ion battery supports up to 10 hour of playtime. Speakerphone for crystal clear calls. 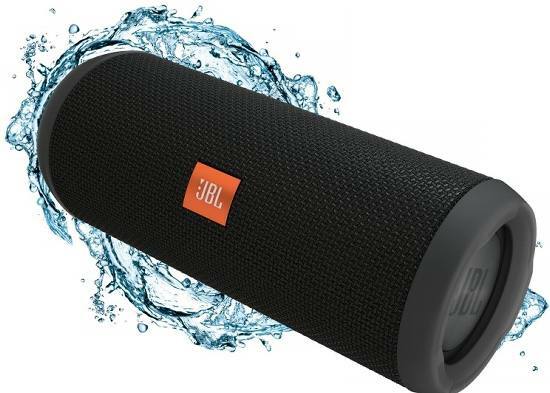 JBL Connect that enabled JBL speakers together creating an ecosystem. Support: A2DP V1.3, AVRCP V1.6, HFP V1.6, HSP V1.2. Transducer: 2 x 40mm. Output power: 2 x 8W. Frequency response: 70Hz - 20kHz. Signal-to-noise ratio: >80dB. Battery type: Lithium-ion polymer (3.7V, 3000mAh). Battery charge time: 3.5 hours @ 5V1A. Dimensions (HxWxD): 64 x 169 x 64 (mm). Colour: Black.